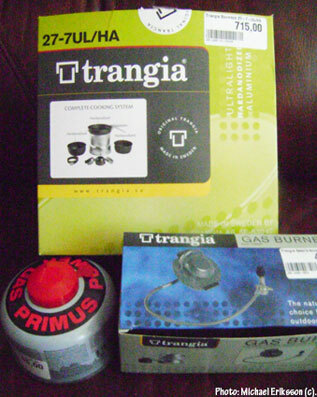 Bought this the other day, a complete cooking system from Swedish manufacturer Trangia (based in Trångsviken, Jämtland County – that´s my neck of the woods actually). What you get is a portable system for backpackers (the Swedish and Finnish armies are using them as well), with a focus on light weight, durability and simple design. The company has been in business since 1925. The system can be fuelled by alcohol, white gasoline fuel or gas cartridges (I´ve opted for the latter, a propane gas from Primus), and you´ll find several reviews by people on YouTube as they test the system. If the power grid fails, this is an important part of what you´ll need to get by.